I wrote about the prospects for the 2014 Bordeaux vintage, below, for Jancis Robinson‘s popular website and for the Livex blog at the start of September. Since then, we’ve had one of the best weeks of the year, with stunning blue skies and bright sunshine. The grapes have come on in leaps and bounds at this crucial time of the season, and the forecast is good. It’s all to play for. Après la pluie, le beau temps. The French equivalent of ’every cloud has a silver lining’ might just prove to be the case, taken literally, for Bordeaux 2014. After a mixed and wet July and a cool, damp August, the sun is shining brightly for the start of September and the forecast is encouraging for a good harvest – if the weather holds. So far, it’s been a growing season of ups and downs. We had an early bud-burst and an initial growth spurt in April, before a chilly May slowed things down (as reported in Bordeaux 2014 – the start of the flowering). Then sunshine at the end of May and throughout the middle of June produced a largely successful flowering – crucial for decent yields after a feeble crop in 2013 and a lower than normal production in 2012. But what of quality? July was only slightly cooler than normal, with the average temperature being around 20.3°C, compared to the 30-year average of 21.3°C. There were sunny days but it was considerably wetter than the norm. Rainfall figures for the month vary enormously from one part of Bordeaux to another because particularly heavy rain fell in some areas on 25 July. Some places saw as much as 100mm in one afternoon. We had 50mm that Friday, the same as the Bordeaux 30-year average for the entire month, with another 75mm during the rest of July. 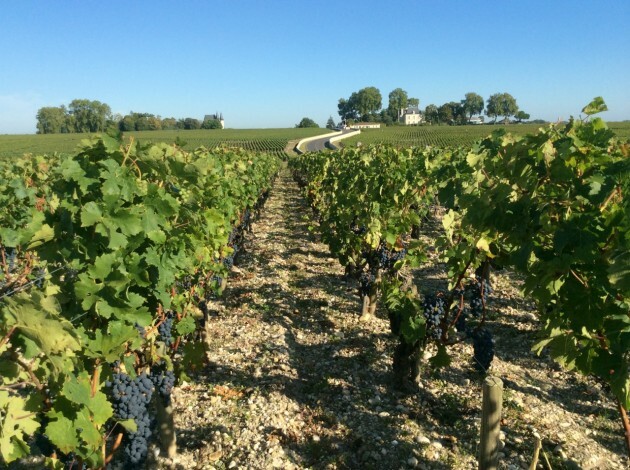 Some appellations, such as Margaux on the Left Bank and St-Emilion on the Right, had 80mm or so of August rain against a monthly average of 56mm, with others closer to the average for the season. Veraison, when the grapes change colour, was stretched out from the end of July in the earlier ripening vineyards through to the final week of August. As my pictures of the same vine in St-Emilion in the last four years shows (below), 2014 is well ahead of 2013, slightly ahead of the later harvest of 2012, and behind the early crop of 2011. What has been significant this summer is not so much the amount of rain or the cooler temperatures, but the humidity in the air. It has been close and humid, albeit with only short bursts of heat, notably in mid-July. One weather station in the Graves reports just 8.5 hours since 22 June of daytime ’dry air’ (less than 40% humidity) compared to 132 hours in 2013, 231 hours in 2012 and 380 hours in 2009. Our salt mill ground to a halt as the contents dampened. More to the point, the mild humidity has been perfect for the development of the delightfully named ’champignons’ (mushrooms) that lead to fungal diseases; all growers have had their work cut out keeping their vineyards free of downy mildew and oidium (powdery mildew). The presence of downy mildew on the leaves in some vineyards – onlookers might think that Autumn has come early in places – seriously hampers the ripening at the very least. Mildew has been more of a threat for vineyards with rather too much vigour in the canopy, less so for those vines on the best sites. Where does that leave us? Despite the relative lack of August sunshine and the humid conditions, many vineyards are in fine shape. You’ll always find some parcels of Merlot with poor fruit set but, on the whole, the flowering went well and the good weather back in June could also prove to be important in other ways. Not only are yields looking healthy, the positive flowering should lead to more consistent ripening of the bunches in the coming weeks; added to which the fine weather at that time allowed anti-rot treatments to be carried out more easily (unromantic it may be but, arguably, the most effective rot treatments are sprayed during the flowering). 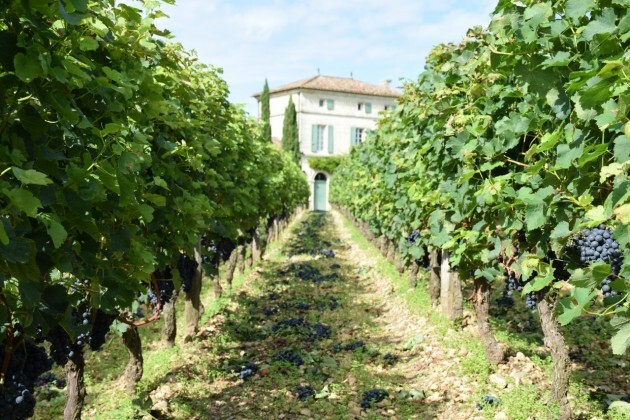 Many chateaux, and not just the famous names, have pulled out all the stops to give their grapes the best chance to ripen. 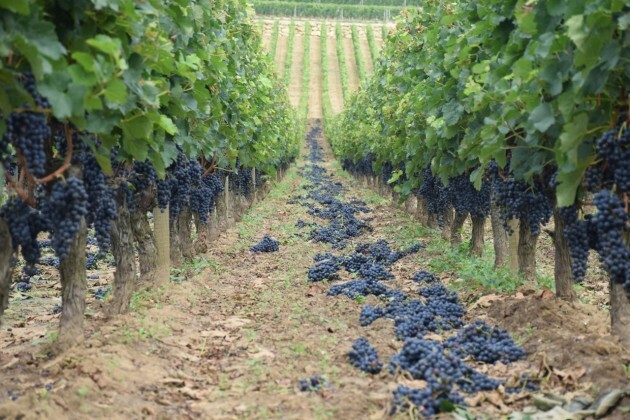 Effeuillage, the removal of leaves from around the bunches, is now being completed on both the morning sun side of the rows (which commonly took place soon after flowering) and now around the bunches facing the afternoon sun. The more the air can circulate around the grapes, the more the risk of rot is reduced. More ambitious is the extent of the late green harvesting on the Merlot in some plots, particularly on the Right Bank. The removal of excess bunches was quite normal back in July and just after the August veraison, but the dumping of healthy looking, dark red bunches by some vineyards at this late stage always perplexes visitors around St-Emilion. ’Green’ harvesting seems the wrong phrase yet it’s clear, with the grapes being plumped up by summer rain, volumes would exceed permitted yields (around 55 hl/ha, depending on the appellation). How the quality will be improved by this seemingly drastic intervention is now dependent on the weather in the final weeks before the harvest. As for comparisons, it’s still too early to call. We’re not going to see the power and concentration of 2000, 2005 or 2010, nor the warmth and generosity of 2009. The September sun saved the weaker vintages of 2002 and 2007 but 2014 is in far better shape going into the final run-up to harvest. It feels like a cross between 2001 and 2004 and it could be just what Bordeaux needs. A good or even very good vintage of extremely drinkable wine, with decent yields and attractive pricing. But there’s a long, long way to go before any of that comes to fruition. El and I are hoping you have a good harvest. We will not be able to attend our own vendange so much appreciated your E-mail! A very informative summary, show us imbibers just how much effort goes into producing a product as consistently good as Bauduc. I am travelling to Cornwall soon and will be sampling some Camel valley, along with Chateau Bauduc, good luck with the harvest. Fine report! May indeed your best hopes for the vintage come to fruition. Really appreciate the highly informative report on 2014 progress, thanks. Just been down in Cornwall, again, and tasted your Sauvignon at Rick Steins. Still a top wine and a favourite with his fish. Good luck this year hope the weather holds up.